Although there’s quite an industry now in debunking claims that something or other is what makes us human, I’ve some sympathy with the slightly different twist in the subtitle of Victoria Williamson’s book: ‘how music reveals what it is to be human.’ You may not have to be human to be musical, but it certainly gives us some interesting insights into our brains. In a detailed exploration of the psychology of music, Williamson takes us into the fact and fable of claims like the old chestnut that listening to music (particularly Mozart) can improve your child’s intelligence. The simple answer is that listening doesn’t, but learning to play an instrument or sing does make a small difference in some very specific brain functions, like being able to distinguish sounds. However it’s worth pointing out that, unless the real aim is to learn how to play or sing, the amount of effort required is totally out of proportion to the gain. And if children aren’t young enough for our voyage into the capabilities of music, even see if music can influence the unborn child. Later on there’s an in-depth look at music in our adult life and the relationship between music and memory – including the remarkable factoid that 30 percent of people can correctly identify the name and artist of a popular song after hearing it for only 0.4 seconds, a tiny snippet of sound. Interestingly, though the people tested were young adults, they found it easiest to identify 1960s and 1970s tunes. Williamson suggests (probably tongue in cheek) that music was better then. I’d suggest it might be more a combination of being the kind of music their parents would listen to – so the music the test subjects were brought up with – and an effect of the way that distinctive tunes were more common back then, in an age without sampling, rapping and song-free dance music. I am reasonably musical – I sang in a Cambridge college chapel choir – so I expected to be absolutely delighted with this book… but though there is lots of lovely material in there, I felt a little let down. In part it is because the style is a little flat – the book felt about twice as long as it really is – but mostly I suspect it is because music psychologists and professional musicians think that music is more important than it really is. Yes, it plays a pivotal role in our teens, but for most of our lives it’s just something to stick in if you are bored in the car or gym or while doing the washing up – or that is very effective at eliciting emotions in the background in films (the music that swells under the ‘Daddy, my daddy!’ sequence in the Railway Children is enough to make me cry without the visuals) – which is immensely powerful, but still not really a of major significance in our lives. 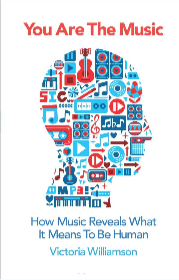 So a brilliant idea, with plenty of really interesting content – and a must-read for anyone that interested in music or the workings of the human brain – but not as enjoyable as I hoped it would be. It’s quite possibly because I was so looking forward to it that it was inevitably a bit of a disappointment – so I do recommend you try it for yourself.